Prominent & Leading Manufacturer from Pune, we offer industrial kitchen. 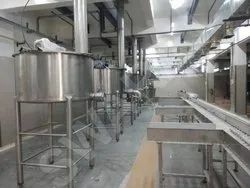 We are leading Designers & Manufacturers of Industrial Kitchens of 5000 Meals to 50000 Meals Per day capacity, We have recently delivered 30 successfull projects in India. These Kitchen Projects were designed considering all the practical experiences in parameters like, Storage, Sanitaization, Preparation, Cooking, Transportation, Handling, and Disposal. These successfull project has givens us a nationwide indentity as LEADING manufactureres of Industrial Kitchen Equipmnets, a new emerging sector of 21st Century. All new concepts are coupled with traditional preparation of Food to provide a unique solution for supplying food for Industrial Manpower. Looking for Industrial Kitchen ?